1. Dow 22,000: The Dow Jones industrial average is within spitting distance of 22,000 points. The U.S. index closed at a record high of 21,964 on Tuesday. 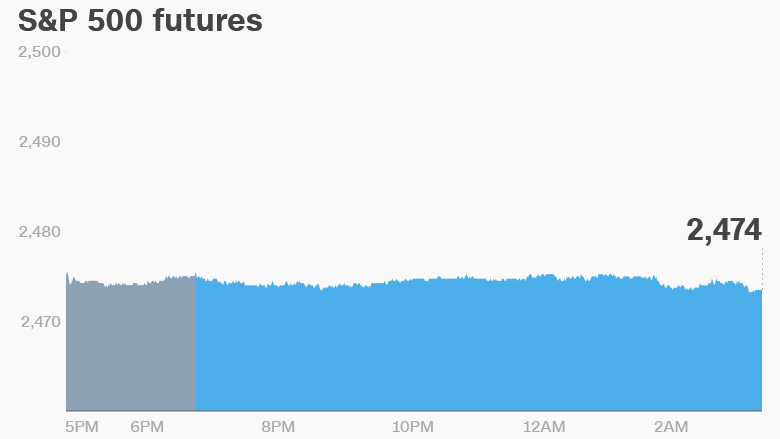 U.S. stock futures are pointing up, indicating the Dow could surpass the 22,000-point mark in early trading. The S&P 500 and Nasdaq are also trading near record highs set in late July. European markets were mostly lower in early trading and Asian markets closed mixed. 2. Apple defies gravity: Shares in Apple (AAPL) are defying the laws of gravity (sorry Isaac Newton!). The stock is in position to set new records on Wednesday. Shares were up 6% in premarket trading after the tech giant released earnings on Tuesday afternoon. Investors are celebrating the company's outlook. Apple estimated that sales for its fourth quarter, which ends in September, could reach $52 billion, more than analysts had expected. That forecast suggested that Apple could launch its newest iPhone model -- expected to be called the iPhone 8 -- in September, despite earlier rumors of a possible delay. 3. AMC's scary trailer: Investors in U.S. cinema chain AMC Entertainment (AMC) have been spooked by an earnings warning. Shares in the company were dropping by about 24% premarket. The firm reported Tuesday afternoon that it had a very weak second quarter and was cutting costs. It expects to report a loss when final results come out next week. The company, controlled by Chinese billionaire Wang Jianlin, said the U.S. film industry had a "weaker than anticipated second quarter and [expects] a very challenging third quarter." 4. Earnings and economics: Groupon (GRPN), Molson Coors Brewing (TAP), Mondelez International (MDLZ), Party City (PRTY), Sinclair Broadcast (SBGI), Sodastream (SODA) and CNN parent company Time Warner (TWX) will release earnings before the open Wednesday. Tesla (TSLA), Sturm Ruger (RGR), AIG (AIG), CenturyLink (CTL), Cheesecake Factory (CAKE), Fitbit (FIT), MetLife (MET), Prudential (PRU), Square (SQ) and Take-Two Interactive (TTWO) will follow after the close. On the economics side, the ADP's private payroll report at 8:15 a.m. ET could move markets. The report will give investors a look at the labor market prior to the release of the government jobs report due Friday. Economists expect the ADP report will show that the private sector added 190,000 jobs in July, according to Briefing.com. The U.S. Energy Information Administration will release weekly data on crude inventories at 10:30 a.m. Crude futures were trading around $49 per barrel, down from $50 per barrel on Tuesday. 5. Diesel summit in Germany: Germany's biggest automakers -- Volkswagen (VLKAY), BMW (BMWYY) and Daimler (DMLRY) -- are gathering with government ministers in Berlin for a 'diesel summit' on Wednesday. They'll discuss ideas on how to reduce diesel emissions as some German cities consider banning diesel cars. Stuttgart -- the home of Daimler's Mercedes-Benz and Volkswagen's Porsche -- is considering a ban on diesel cars as early as January 1.